Four Battalions of the Royal Irish Fusiliers took part in the Battle of the Somme, 1916. The 1st. Battalion (Regular) formed part of the 10th. Brigade, 4th. Division, the 7th. and 8th. Battalions were in the 49th. Brigade, 16th. (Irish) Division and the 9th. Battalion formed part of the 108th. Brigade, 36th. (Ulster) Division. The part played by the three later battalions is related in the story of the 16th. Division and the 36th. Division respectively. On the opening day of the battle, 1st July, 1916, the 1st. Bn. in the 4th. Division was still waiting to assault as its sister battalion, the 9th. Service Bn., was being cut to pieces in its advance with the Ulster Division. The 10th. Bde. was to advance in support of the 11th. and 12th. Brigades. As the leading Brigades formed up in front of their trenches, just before Zero Hour, they were met by continuous machine-gun fire and a wall of exploding shells which moved across No-Man's-Land towards them. But the attack was made and the German lines were penetrated at several points. The crucial question was; has the leading brigades reached their objectives? If they had, the 10th. Bde. must be held back or might otherwise be exposed to useless slaughter. Unfortunately, it was impossible to say how far the leading troops had got or in what strength. The signal for 'stopped by uncut wire' - One White Flare - was too much like the signal for 'Objective Gained' - three white flares - for observers to tell the difference between them. Messages had to be taken by runners across No-Man's-Land under much prodigious fire that many were lost. In consequence the 10th. Bde. began to move forward so as to cross the British Front Line at the time previously set; 9.30 a.m. Orders to remain in the trenches until further notice were not received in time and the supporting brigade had already started to move forward. Like the leading Brigades they lost many men, but those who got through joined the leading troops in the melee in the German trenches. Due to the terrible artillery fire the 1st. Royal Irish Fusiliers was held up in the British front line where they were pinned down for some time. At 1.25 p.m. the Commanding Officer was ordered to send one Company forward with the 1st. Warwicks, which was also a support battalion in the 10th. Bde. They were to cross No-Man's-Land and reinforce a mixed party of Seaforths and Lancashire Fusiliers, who were hanging on to a salient in the enemy line known as the Quadrilateral, in face of repeated vicious enemy counter-attacks. "C" Coy. was sent on this errand which failed despite several attempts to brave the storm of machine-gun fire. The Company Commander was severely wounded. Realising at about 4 p.m. that "C" Coy. had not reached the Quadrilateral, the Bn. Commander now dispatched "D" Coy. on the same task. This company was successful and joined the Seaforths in the Quadrilateral. Some hours later, through confused orders, all troops except "D" Coy. withdrew from the Quadrilateral; these men were left in a very exposed position in the enemy line. Runners failed to get through to them during the night and it was feared that the company had been overwhelmed. In fact it had a busy and successful stay, fighting off enemy bombing-attacks with great spirit. Contact was made with Bn. H.Q. and the Company withdrew in good order at 11 a.m. next morning bringing with them all their wounded, three prisoners and a quantity of arms and stores. The 4th. Division remained in the line for some weeks after this. The 1st. R.I. Fus. taking its turn in the trenches and helping in the sad task of burying the dead who had to be retrieved from No-Man's-Land. On July 17th the battalion was relieved and went into reserve, shortly afterwards it received orders to move further north and took no further part in the Somme blood bath. The above text is taken from a typed manuscript which was written in 1966 and was signed with the initials W.A.S. If anyone knows who the original author was I would like to hear from you so that it can be properly attributed. Simultaneously with the attack on Thiepval Ridge by the Ulster Division and the 32nd. Division on the 1st July, the extreme southern end of the ridge was attacked by the 8th. Division who formed part of the 3rd. Corps. In the 25th. Brigade of the 8th. Division was the 1st. Bn. The Royal Irish Rifles. The battalion was in the line directly opposite the strongly fortified village of Ovilliers just a few hundred yards north of the main Albert-Bapaume Road or what was left of it. The objective of the 25th. Brigade was the village of Pozieres, two kilometres further along the Albert-Bapaume Road -- a rather ambitious project. The battalion was to advance in support of the other battalions in the Brigade. The leading battalions having taken Ovilliers -- 1 RIR was to move forward and consolidate with the leading battalions, it was then to make the assault an Pozieres itself. As mentioned in the story of the Ulster Division's attack on the Thiepval Ridge, a tremendous bombardment preceded the attack. At zero. 7.30 a.m. the Brigade advanced forward to the attack on the German Front Line. They were met with a veritable avalanche of machine-gun and mortar fire. Few men of the leading battalions ever reached the enemy wire, which had not been thoroughly cut by the British bombardment and presented a difficult problem for the leading sections. The few sections who did enter the enemy front line held on grimly against a fierce fusillade of fire from the enemy until the arrival of the 1st. Rifles who were advancing to their support. The Rifles advance was met with similar shattering fire from a mass of strong points covering the German positions which had been entered and were being assaulted by the supporting Rifle Bn. The village of La Boiselle on their right flank had not been captured and from this point the enemy poured a hurricane of machine-gun and mortar fire into the ranks of the attacking riflemen and only a mere handful of men ever reached the German Front Line. These together with those of the leading battalions who were already in the enemy front trenches had to beat off continuous hostile bombing attacks from the enemy elements who had been sheltering in their deep cellars during our bombardment and now came out into the daylight to fire on our already severely mauled infantry. The company on the left, "A" Coy., overran the German Front Line and reached the second support trench and inflicted men losses on the enemy holding out there but alas due to their flanks not succeeding they were eventually forced to withdraw. Eventually all the British troops who had entered the enemy positions had to retire to their own front line, these represented only a mere fraction of those who went into the attack. As was the case on Thiepval Ridge, the flanks having failed any small breaches made were forced to fall back to secure their flanks. The Battalion lost its Commanding Officer, its Adjutant and six other Officers, twelve Officers were wounded and other ranks casualties amounted to 348, many of these were 'Missing' believed killed. Every man had given of his beat, the men had gone into action with high hopes of victory and fought as though they expected it, but their task was an impossible one, they gained nothing but glory, Ovilliers was a very strongly fortified objective in common with other villages on this part of the front and was not to be entered again by British Troops until the end of September. What remained of the battalion was taken out of the line that night and a couple of days later was ordered north to the rather more quiet area around Bethune. However, its association with the Somme battlefield was not at an end. On October 14th the battalion entrained at Lillers for its second venture on the Somme. While the 2nd. Bn. was involved in the Battle of the Ancre Heights over the same ground attacked by the Ulster Divison on 1st July, the 1st. Battalion went into the attack with the 8th. Division between Morval and Les Boeufs. The objective of the 25th. Brigade was Zenith Trench and 300 yards further on a trench known as Misty Trench. The Bn. advanced in support of the 2nd. Lincolns and the 2nd. Rifle Brigade, although limited success was achieved the assault was a failure, in no small measure due to the severe casualties inflicted on the advancing troops of the Brigade by our own artillery and to the fierce stubborn resistance put up by the enemy holding on to what they considered a key position. The battalion was now moved to Trones Wood where it remained in the line for two or three weeks and had to endure terrible privations due to the appalling conditions in the trenches, if they could be called trenches, the British Front Line consisted of a mass of water filled shell holes and craters, many of them containing half decomposed bodies which could not be properly buried in the circumstances prevailing. On top of all this the enemy kept up a continuous bombardment both day and night, in which gas was largely used and the battalion suffered severely. This was probably one of the worst periods of endurance the battalion had to suffer during the whole war, the long exposure to wet and cold without cover of any kind beggars description, the strain on the men was almost intolerable, but somehow the battalion came through but lost a great proportion of its strength by the time it was relieved for a few days respite. With the fall of Beaumont-Hamel and the capture of St. Pierre Divion and Grandcourt on the Ancre on 15th November and the following two days the Battle of the Somme came to an end on 18th November, 1916. At this time the 1st. Bn. Royal Irish Rifles were holding the line facing the village of Le Transloy on the main Bapaume/Perrone Road from which line the Germans were, a couple of months later, compelled to retire "according to plan" to the new Hindenburg Line. 2nd. Bn. The Royal Irish Rifles. A few days after the 1st. Battalion was withdrawn from the line on the night of July 1st., the 2nd. Battalion came into action at practically the same spot facing the German Line between Ovilliers and La Boiselle. It formed part of the 74th. Brigade, 25th. Division in the newly formed 5th. Army (later to become famous) under General Sir Hubert Gough. During the first few days of July further strong attacks were made on both Ovilliers and La Boiselle and although a foothold was gained in La Boiselle, the fortress of Ovilliers resisted all attempts at capture. By 5th July La Boiselle was completely in British hands and in an effort to exploit this advantage and outflank Ovilliers, the 47th. Brigade was put at the disposal of the 12th. Division. The Brigade was to attack towards the eastern side of the Ovilliers defences. The Rifles advanced in support of a battalion of the North Lancs and a battalion of Cheshires. The leading battalions advanced with great dash and by 9 a.m. the whole of the German front protecting the eastern defences of Ovilliers was in our hands except a gap of some 400 yards in front of the Cheshires. The 2nd. Rifles were now ordered to assault this gap, capture and consolidate it. During consolidation the men were amazed by what they found in the German dug-outs and the palatial underground dwellings with separate quarters for Officers, kitchens, telephone exchanges, elaborate first-aid quarters and well appointed bunks for the men up to the standard of any barrack room. Our army had never experienced anything approaching this. During the night the 2nd. Bn. made bombing attacks and further progress was made into the hostile defensive system. During the following day the enemy made strong counter-attacks but all were beaten of with considerable loss to the enemy. This type of fighting continued for the next day and on this night the battalion was relieved having suffered some 200 casualties in the three days fighting. Their rest in reserve lasted only two days before they were back in the line again, this time facing Ovilliers itself, the attack on this fortress village, which had resisted all attempts to reduce it, was to be made at dusk with all three brigades of the Division, each Brigade having not more than 300 yards frontage, a moat ambitious venture in the darkness. The attack was not a complete success, despite the large force employed. The advance was raked with machine-gun fire and casualties were heavy. As a consequence of heavy losses and disorganisation in the darkness the battalion was forced to withdraw with the other units in the brigade. On the right of the Rifles a battalion of the Warwickshires was cut off and the only way to relieve them was for the 2nd. Rifles to bomb its way up a trench which led to the surrounded Warwicks. Although the bombers fought desperately no progress was made, continued efforts were made next day but only slight gains were made. Eventually towards dusk on the second day a renewed attack was made with the help of a battalion of the Lancashire Fusiliers. The fighting was desperate and when it was seen that no progress could be made, suddenly there came the dramatic end, a white flag was hoisted by the enemy, orders were passed to our men to stand upon their guard, it might be a trick, but no! from all sides heads appeared and hands were raised to the accompaniment of "Kammerad"! The whole party had surrendered, Ovilliers had fallen, an expensive victory but nevertheless it put new life into our men. The Bosche had made a splendid defence, but now they seemed to be delighted to be taken prisoner and out of it all, and insisted in shaking hands with their captors. A great quantity of booty of all kinds was taken during the 'mopping-up' of the elaborate trench system which continued throughout the following day. Later that night the battalion was relieved and marched back to Beauval to rest. After several days rest the battalion moved into the line again to engage trench warfare, it relieved another battalion of Ulstermen, 1st. Bn. Inniskilling Fusiliers of 29th. Division opposite the village of Beaumont-Hamel and the salient known as Mary Redan. This was the part of the line north of the River Ancre where the attack on 1st July had been a total failure and No-Man's-Land was still full of 29th. Division's dead. This was the pattern of trench warfare in which the battalion engaged for the next month or two moving in and out of the line at places well known to the Ulster Division, but now static, namely the Schwaben Redoubt, Thiepval Wood, St. Pierre Divion etc. In the month of October the 2nd. Bn. took part in the Battle of the Ancre Heights which included the capture of many places which had been taken by the Ulster Division on 1st July but which had to be evacuated because no advance had been made on their flanks. The Bn. took part in the capture of Stuff Redoubt, Houquet Farm, Regina Trench, Courcellette and St. Pierre Divion. The casualties in these actions were comparatively light compared with earlier Somme actions, this was probably due to the fact that British troops were now in possession of many German fortified positions with their elaborately furnished underground cellars which afforded perfect cover against bombardment. It can be said with certainty that enemy losses were very considerably more than British losses in these final actions during the closing days of the Battle of the Somme. Seven battalions of the Royal Inniskilling Fusiliers took part in the Battle of The Somme, 1916. The two Regular Battalions the 1st. and 2nd. were in the 29th. and 32nd. Divisions respectively. The 7th. and 8th. Battalions served with the 16th. (Irish) Division and the 9th. 10th. & 11th. Battalions with the 36th. (Ulster) Division. The story of the Irish Division and the Ulster Division at the Somme is told in the chapters on these two Divisions. The 1st. Battalion The Royal Inniskilling Fusiliers formed part of the 87th. Brigade of the 29th. Division. On 1st July this Bn. was holding the Line in front of the enemy strong-point known as Hawthorn Redoubt between the River Ancre and the strongly defended village of Beaumont-Hamel and was on the immediate left of the 12th. Bn. The Royal Irish Rifles of the 36th. (Ulster) Division. The task assigned to the 29th. Division was to capture the German positions along the ridge between Beaumont-Hamel and the 36th. Division's left, a most hopeless task, as the result proved. The enemy position rose in terrace after terrace of formidable entrenchments set thick with machine-gun posts with a perfect field of fire for hundreds of yards between them and the British front line trench. At zero (7.30 a.m.) the Inniskillings moved forward in the general attack in lines of Platoons in Single File, immediately they got out of their assembly trenches they were met with a driving rain of machine-gun and rifle fire combined with a mortar and artillery barrage, it seemed impossible that anything could survive in such a cauldron of fire. The men faced the storm unflinchingly, the casualties were terrible and included the Commanding Officer killed with eleven other Officers before they had moved a hundred yards. A mere remnant of the battalion reached the enemy wire, there only to find that the wire had not been cut by our Artillery bombardment, this made further movement impossible. At this point they were met with heavy cross-fire from neighbouring enemy strong-points and what was left of the battalion had to take cover as best they could in the shell holes, movement in any direction being impossible. It was quite impossible to bring up reserves and eventually the whole 87th. Brigade, or what was left of it was compelled to retire, this in itself was a hazardous undertaking, and by the time they had returned to their own trenches many more casualties resulted. The casualties in the Inniskillings were desolating for that day, amounting in all, to 549 killed, wounded and missing. From the beginning the venture was a hopeless task, but the men put all they had into it and yet not a yard was gained. The Battalion remained in reserve in this area until brought up to strength by drafts from home and in a couple of weeks moved north to Hazebrouck and the Ypres Salient. During the first week in October the battalion returned to the Somme Area and went into the Line in the Montauban Sector but took no part in any further major operation until the Somme Battle ended. The 2nd. Battalion was in the Line on 1st July as part of the 96th. Brigade 32nd. Division. Their sector was immediately in front of Thiepval Village and on the right of their three sister battalions in the Ulster Division, the 9th. 10th. & 11th. Their allotted task was to advance in support of the two leading battalions of the Brigade. At 7.30 a.m. on that fateful morning the heavy British bombardment of the German positions suddenly ceased, and the air fell suddenly still, that moment of silence, seemed to some a year as the leading infantry left their trenches and moved forward. In common with the whole front they were immediately met with a murderous fire from everything the enemy had got, and although a little ground was gained the attack did not prosper. Three Companies of the Inniskillings were moved forward to the assistance of the leading battalions of English Infantry who had sustained terrible casualties and were being pinned down by the heavy machine-gun fire from the Thiepval Fortress. A little ground had been gained north of the village and the Division on the immediate left, the 36th. (Ulster) Division had made good progress. Shortly after mid-day an attack by all the available force of the Brigade was made from the positions gained in an attempt to turn the enemy flank at Thiepval, but all was in vain. The murderous fire from the enemy machine-guns made it impossible to advance a yard and due to the appalling casualties the whole of the 96th. Brigade was in effect out of the battle. During the afternoon units of the 49th. Division, whose role was to move in support of the 32nd. & 36th. Divisions, were sent forward to try and fill the gap which now existed between the left wing of the 32nd. Division and the right of the Ulster Division but nothing decisive was the result. The 2nd. Inniskillings during the rest of the day held trenches in the right rear of their three sister battalions in the Ulster Division. In spite of heavy casualties inflicted by enemy bombers and continuous machine-gun fire from the Thiepval Fortress the battalion held on to their positions throughout the night and all the next day. With the remnants of their Brigade they were relieved on the morning of the 3rd July. After a few days out of the line the battalion was back in the trenches again, this time in font of the Ovilliers-La Boiselle sector, further to the right of Thiepval. Here on 9th July it went into the attack on a series of enemy trenches in front of Ovilliers which had resisted all efforts at capture since the opening of the battle on 1st. Advancing with great dash and resolution the battalion overran, captured and consolidated two lines of hostile trenches in their immediate front. Determined enemy counter-attacks followed in quick succession throughout the day but all efforts on the part of the Germans were held off with severe loss to the enemy. Again on the 13th July the 2nd. Inniskillings together with the 17th. H.L.I. went into the attack in an effort to extend their gains of a few days earlier, but this attack did not prove so successful as that on the 9th., casualties were so heavy in both Officers and Men that they could not hold on to the positions reached and were compelled to retire to their start point. The Battalion somewhat depleted in numbers were relieved in the front line on July 14 and were to take no further part in the Somme fighting. The 16th. (Irish) Division raised in Ireland at the outbreak of the 1914-18 War included no fewer than Seven Ulster Battalions, each of approximately 1,000 men, viz; 7th. and 8th. Bns. The Royal Inniskilling Fusiliers, 7th. Bn. The Royal Irish Rifles and the 7th. and 8th. Bns. The Royal Irish Fusiliers. As well as this the Division included the 6th. Bn. The Connaught Rangers which included over 600 Ulstermen recruited, in the greater part, in Belfast. 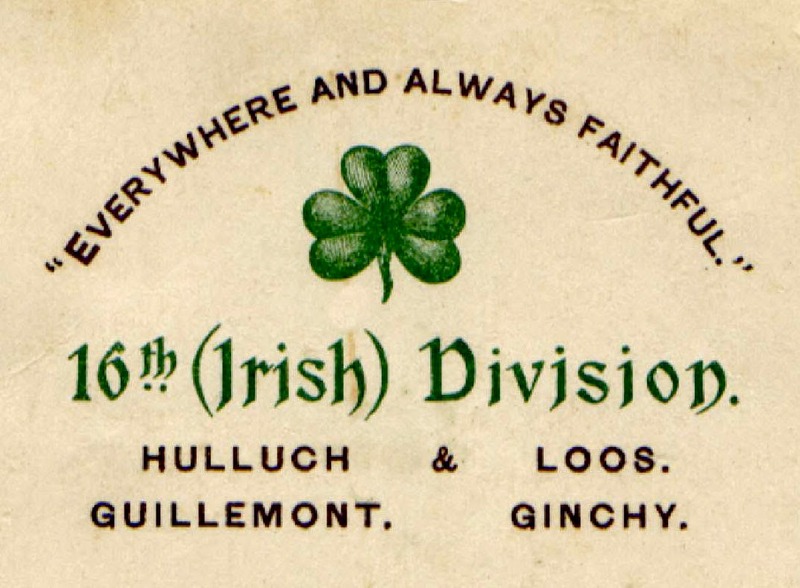 This Division made a great name for itself during the war and on several occasions fought side-by-side with the 36th. (Ulster) Division, notably at the Battle of Messines, June, 1917. It was however at the Battle of the Somme 1916 in the assaults on the villages of Guillemont and Ginchy in September 1916 that the Division is most prominently identified. The 49th. Brigade, comprising the two Inniskilling Battalions and the two Irish Fusilier Battalions and the 47th and 48th. Brigades, the latter including the 7th. Bn. The Royal Irish Rifles, attacked the fortified village of Guillemont, situated close to the junction of the French and British Armies and therefore of great importance from a tactical point of view. Its capture was the most important achievement of the British Army since the taking of Pozieres. It was the last unconquered position in the old German Second defensive system between Mouquet Farm (near Thiepval) and the junction of the French and British Armies near Combles. The conditions in which the Irishmen had to advance were appalling, the whole of this area was a scene of complete desolation and odious mud, churned up by continuous British bombardment during many unsuccessful attacks on this stubborn bastion since the battle of the Somme opened on 1st July. Movement over the ground in such conditions required a supreme effort apart altogether from the fierce hurricane of machine-gun and artillery fire which the enemy brought to bear on the advancing troops. Nevertheless the advancing Fusiliers and Riflemen hacked their way forward with great determination and traditional Irish dash in spite of the most severe casualties and drove the Germans from their positions, inflicting heavy loss on the defenders and taking many prisoners. A fierce enemy counter-attack on the newly won position in Leuse Wood was decisively beaten off by the two Inniskilling Battalions and the whole of the newly won line firmly held. The newly won ground had to be defended stubbornly for the next few days against many hostile onslaughts, the enemy realised he had lost as important key position and put in great efforts to regain the position lost to the Irishmen. On September 9th, the 14th. Division again greatly distinguished itself by capturing the closely neighbouring village of Ginchy in an equally brilliant fashion. The attack was delivered during the afternoon of the 9th, and was one of the few successful attacks in a large scale British attempt at further advance. The Ulstermen of the Inniskillings, the Irish Fusiliers and the Rifles advanced with great determination through a fierce barrage of enemy fire so intense as to suggest that not even an insect could have survived in that hell of fire and death. The 47th. Bde, suffered terrible casualties during the assault and the 49th. Bde, moving forward in support came in for heavy punishment from the German Artillery and heavy machine-gun fire. The 7th. Rifles in the 48th. Brigade met with similar stubborn fierce resistance but not only did they capture their objective but a young Rifles Officer rallied a composite party of Dublins, Munsters and Rifles and led them through the village to the second, supporting, enemy position. Although they captured this position and dealt with the defenders who did not manage to escape, they found themselves too far forward and in an exposed position, the young subaltern very wisely led them back to the conforming British Line. The capture of the German defence system at Ginchy was followed by a magnificent attack at short notice by the two Irish Fusilier Battalions on the enemy position north of Combles. This point was causing a lot of trouble to our troops in the newly won trenches and well did the "Faughs" eliminate the cause. Some idea of the severity of the fighting in which the Ulster Brigade and the 7th. Rifles had come through may be judged from the fact that their casualties ran into four figures, but although the price was high an important and far reaching victory had been won. The 24th. Division was shortly afterwards taken out of the line ato reorganise and a few weeks of afterwards found it with the Second Army in Flanders alongside the 36th (Ulster) Division. Here both Divisions were to remain until they, side-by-side, carried all before them in that brilliant and most perfect battle of the whole war - The Battle of Messines. The 10th Corps consisted of the 32nd. Division, the 36th. 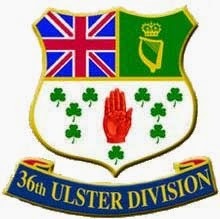 (Ulster) Division and in support the 49th. Division. The 36th.Division embraced 3 Battalions of the Royal Inniskilling Fusiliers, 9 Battalions of the Royal Irish Rifles and one battalion of the Royal Irish Fusiliers, each battalion about 1,000 strong. These battalions in three Brigades, 107th. 106th. and 109th. each of four battalions, together with One Battalion of Pioneers (16th. R.I.R), Divisional Artillery, Field Companies of the Royal Engineers, Army Service Corps and Field Ambulances, all volunteers and all Ulstermen. The Ulstermen's front lay astride the River Ancre and along the lower slopes of Thiepval Ridge as far as the southern edge of Thiepval Wood. Facing its centre was the strongly fortified village of St.Pierre Divion and the notorious Schwaben Redoubt (the most formidable on the whole front) with the Stuff Redoubt supporting these two. The whole of this front was well covered by heavy machine-guns firing from Thiepval Village on the right and the fortified villages of Beaucourt and Beaumont-Hamel on the left, all supported with a great concentration of artillery of all calibres. Shortly after dawn on the morning of Saturday 1st July every gun on a front of 25 miles was firing. The roar was incessant and quite indescribable, at eight minutes before zero hundreds of Stokes Mortars joined in with a hurricane bombardment of 30 rounds a minute on the German defences. At 7.30 a.m. wave after wave of British Infantry roso and with bayonets glistening in the morning sun moved forward as the hurricane barrage lifted to the German second line, the air was filled with smoke and mist in the trail of the great barrage. The Ulstermen carried all before them and immediately overran the German first and support line. Within half-an-hour the 9th Inniskillings of the 109th. Brigade weer in the enemy Second Line and were sending back prisoners. By 8.30 a.m. the 109th. Brigade after very fierce hand-to-hand fighting captured and firmly established themselves in the supposedly impregnable Schwaben Redoubt. On their immediate left the 11th. and 13th. Rifles advanced rapidly and before 9 a.m. were before the Hansa Line protecting the Thiepval-Grandcourt Road. It was most unfortunate for them that St. Pierre Divion had not been captured and was already being bi-passed by these two Rifle battalions. The 12th. Rifles and the 9th. Irish Fusiliers across the Ancre on their left, after an initial success were held up by the vicious machine-gun fire from Beaucourt and Beaumont-Hamel and the failure of the 29th. Division attack on the fortress of Beaumont-Hamel and the rising ground on their immediate front. The machine-gun posts at St. Pierre Divion wrought havoc in the ranks of the 108th. Brigade, the 12th. Rifles and the 9th. Irish Fusiliers were pinned down when they reached the enemy first line, and suffered terribly, the latter lost practically all their officers. A similar fate befell the 11th. and 13th. Rifles but in spite of the terrible casualties these two battalions, or what was left of them continued their advance to the outskirts of Grandcourt (this village was not to be entered again until after the fall of Beaumont-Hamel on 15th November). This produced a dangerous and exposed position for them, being fired on from both flanks and indeed their rear. The 107th. Bde. (Belfast) advancing in support of the two leading Brigades were now advancing through the positions captured by the two leading Brigades and were now attacking the Stuff Redoubt, a strongly fortified and stubbornly held enemy strong point in the German 3rd. Line. Near the spot called the Crucifix the 11th. Inniskillings and the 14th. Rifles (YCV) found themselves being machine-gunned and plastered with mortar fire from their rear and suffered terribly. German machine-gunners and mortar crews who had sheltered in the deep cellars during the heavy British bombardment now, it must be admitted with great gallantry, came up out of their caverns to fire into the rear of the advancing infantry. No-Man's-Land became a ghastly spectacle of dead and wounded. The 15th. Rifles of the 107th. Brigade were now in the Stuff Redoubt and set about dealing with numerous machine-gun nests who had emerged from their hiding places, the scene can only be described as bloody in the fierce hand-to-hand fighting which ensued and many were the acts of extreme gallantry, most of which passed unrecorded. The hurricane of machine-gun fire from the fortress of Thiepval, which had unfortunately not been captured by the 32nd. Division on the right, played havoc among the ranks of the 8th. 9th. and 10th Rifles as they moved forward in support of the advanced positions gained by the leading battalions, in spite of the awful carnage they continued unfaltering as if on parade. The 10th. Rifles suffered terribly and lost their Commanding Officer who was killed leading his battalion to the assault. Colonel Bernard was the only battalion commander killed on this day, as Commanding Officers were expressly forbidden to accompany their battalions in the assault and were ordered to control the advance of their respective units from their battle headquarters, no explanation is forthcoming as to why this C.O. found it necessary to lead his battalion into the attack. The 107th. Brigade battalions, sadly depleted, reached the final objective together with the remnants of the leading Brigades. Along this, the "D" or Fourth Line, they proceeded to consolidate and establish themselves. Grimly they had to beat of continuous bombing attacks until the late afternoon. Several fighting patrols were sent forward and one such patrol actually entered the notorious Mouquet Farm and found it vacated. It is now known that about this time the Divisional Commander 36th. Division (General Oliver Nugent) was considering whether to continue the advance into the open country which had now been reached. He had asked Corps Headquarters whether he should halt his advancing Division where they stood in view of the fact that neither of the Divisions on hos flanks had gained a yard. The reply was that a new and more forceful attack would be made on Thiepval Village and also on his left towards Beaumont-Hamel. He was assured that a Brigade of the 49th. Division was being sent to his support and that he should continue his advance as was the original plan. This order from Corps. HQ., however, was cancelled ¾ of an hour later. His advance forward had already begun and every effort was made to halt the advancing troops, but as communication was extremely difficult the message arrived too late. The job of communication had to be done by runner and the process was a very long affair, fortunate was he who crossed than zone of death unscathed. Of those who went forward in the advance into open country few returned to tell the story, as they ran into masses of enemy reinforcements moving forward to heal the breach made in their line by the Ulstermen. The Fourth Line was held, however, against all onslaughts by handfuls of determined men in the hope that the promised reinforcements would arrive, unfortunately this was not to be. The Ulster Division in spite of the fact that more than half its strength were now casualties held in their grasp the promise of a great and far-reaching victory if the breach which they had made in the strongest part of the enemy defence system could have been put to use. Some 5,000 Ulstermen, though closely wedged in all round by the enemy but thrust well into the enemy line, constituted what could have been the pivot for both wings of the British Line to move forward in the attack, but for some never explained reason nothing was done about it. The Thiepval spur was undoubtedly the German key position and when eventually in the month of October and early November it was finally captured the whole German Line was compelled to retire some distance and eventually as the newly won British positions made the enemy line untenable the whole German Army in the Somme sector retired "according to plan" to the Hindenburg Line 30 miles away. Unfortunately the British casualties in the Somme battles since 1st July had passed the 250,000 mark. Meanwhile the situation had grown considerably worse for the already sorely tried Ulstermen in the forward zone of the deep salient which they had created. After beating off continuous hostile counter-attacks throughout the remainder of the day of July 1st by German bombers coming up from Thiepval in their right-rear and from Grandcourt on their left and with ammunition and supplies practically run out the situation became desperate. Officers in the advanced positions had observed through their field-glasses trainloads of German Reserves arriving beyond Grandcourt during the evening. A large scale counter-attack was launched by these enemy reinforcements at dusk and drove our exhausted men back into the 2nd. Line which they had overrun earlier that morning. The northern end of the Schwaben Redoubt was again in German hands. During the night of 1st/2nd July three battalions from the 148th. Brigade, 49th. Division were at last put at the disposal of the 36th. Division with the object of re-taking the Schwaben Redoubt and attacking Thiepval Village from the rear with the assistance of the remnants of the 107th. and 109th. Brigades. But alas at 1 a.m. two of these battalions had not arrived and the venture had to be called off. The near exhausted troops holding on grimly to the 2nd. Line had to beat off more enemy attacks throughout the night, but the Line held, and a number of prisoners were taken. The sadly depleted units in the line now held had to fight off vicious enemy attacks all through the second day and no further relief came. Casualties mounted and many who had survived the previous day's onslaught lost their lives due to the terrible artillery and mortar fire brought to bear upon them. The problem of reinforcing and supplying the units in the forward positions was fraught with danger due to the ever narrowing width of the salient held. Several parties of the 16th. Rifles (Pioneers) with supplies of bombs ammunition and water very gallantly went through the hellish enemy barrage in support of the men holding on grimly to the southern end of the Schwaben Redoubt and joined in in the defence with their hard pressed comrades. That night, Sunday 2nd July, the Ulster Division was relieved by the 49th. Division, the relief was complete by 10 a.m. on the morning of the 3rd July when the battle scarred and weary remnants of the gallant Ulster Division, less than half the numbers who went "over-the-top" on the morning of 1st July, marched into the Martinsart Area and immediately flung themselves down to sleep. Mention must be made of the supporting troops of the Ulster Division. All gave of their best in support of the heroic effort of the infantry. The Divisional Artillery under most trying conditions and continuous bombardment carried out their task in the true tradition of the British Gunner. The wire in front of all four German Lines was well out when compared with other parts of the battle front. This was in no small measure why the infantry was able to advance with such speed. It should here be mentioned that a Regiment of French Artillery also supported the Ulster Division during the assault and no doubt added considerably to the success of the effective role played by the artillery on this sector of the front. The Royal Engineers, who suffered severely, showed devotion to duty of the highest order regardless to the pounding they took from the enemy barrage of shell and bullet. The Field Ambulances worked unceasingly and heroically in their work of succour for the wounded and the dying. The Army Service Corps Supply Columns gave of their best in their vital supporting role and in common with other supporting elements suffered severe casualties. In all it can truthfully be said that the Division worked well in this their first major, and perhaps greatest, ordeal. All ranks from the highest down had acquitted themselves in the traditional fighting spirit of their race and in the best traditions of the famous Ulster Regiments to which they belonged. The Ulster Division's assault on Thiepval Ridge and along the Ancre Valley though carried out with brilliant dash and complete success on the opening day and well into the second day and alone of all the divisions in the Northern Sector had taken all their objectives and held on to them for a day-and-a-half their success was not exploited. They had created a deep narrow salient 3,000 yards in depth and approximately half that distance in width, they had overrun and captured the most formidable and reputedly impregnable positions on the whole Western Front and inflicted severe casualties on the enemy, but the Divisions on both their flanks failed to make any movement forward leaving the strongly fortified village of Thiepval and the Leipzig Redoubt on their right and the fortresses of Beaumont-Hamel and Beaucourt on their left unconquered. In spite of this the situation created by the advance of the Ulstermen could have undoubtedly been exploited if someone with the initiative of a Montgomery or a Patton had been there and decided to infiltrate reinforcements into the large gap made in the hostile line, however, the word infiltration had not yet crept into the British military vocabulary and nothing was done and a great opportunity was lost. Haig as a cavalryman had an obsession for cavalry and had taken the Cavalry Units, who for over eighteen months had been used as Infantry in the trenches, out of the trenches and assembled a Cavalry Corps comprising three Cavalry Divisions at some distance behind the front attacked, in the hope of a breakthrough - but this was wishful thinking - Cavalry had long since ceased to fit into the pattern of modern war and the "Tank" was still on the secret list. In any case it would have been quite impossible for horses to make their way across the deep trench systems deeply shell-pocked and covered with forests of barbed-wire entanglements running to a depth of two or three kilometres before the open country was reached. No cavalry could have advanced in face of the thousands of enemy machine-guns which faced the British advance. Why then was the Cavalry not allowed to remain dismounted as Infantry and take their place in the general assault, three further supporting divisions would have been very useful as things turned out. As previously mentioned, what remained of the 36th. Division was taken out of the line on the morning of the 3rd July and placed in reserve around Martinsart, a few days later it was taken further back to reorganise in the Bernaville area. The Divisional Artillery, the Royal Engineers and the 16th. Royal Irish Rifles (Pioneers) remained in the line to carry on their hazardous duties in support of other divisions. On July 12th the Division less Artillery received orders to move to Flanders. So ended the 36th (Ulster) Division's first great ordeal. It had cause to be proud of the valiant part it played in this the greatest battle the world had ever seen. Against immense difficulties and the most formidable defences, both Officers and Men had shown the highest degree of personal courage and had won for themselves and their Province a proud place in history. This, alas, was achieved only at a terrible cost in young lives, the Division lost 5,553 Officers and Men in the two days they were in action and practically every home in Ulster was thrown into mourning. We can do no better than end the story of the Ulster Division at the Somme than with Winston Churchill's famous words to the men of the IV Army after the battle ended: "Unconquerable by death, which they had conquered, they have set up a monument of native virtue which will command the wonder, the reverence and the gratitude of our island people so long as we endure as a nation of men". The following extract and associated articles were written in 1966. Ulster has reason to be proud of the part played by her sons in the Great War of 1914-1918 and particularly so during the great Battle of The Somme fought 50 years ago this year. Men and women of all creeds and classes joined up in the services in their tens of thousands. No fewer than 75,000 men voluntarily enlisted in the Army alone between August, 1914 and November 1918 and many thousands joined the Navy and Merchant Navy. Of these numbers over 50,000 were given by the City of Belfast, a truly magnificent record. The Royal Inniskilling Fusiliers 13 Bns. The Royal Irish Rifles (now R.U.R) 21 Bns. The Royal Irish Fusiliers 11 Bns. 36th. Div. Train & Supply Column, Army Service Corps. 108th. 109th. & 110th. Field Ambulances, R.A.M.C. 48th. Mobile Section Army Veterinary Corps. 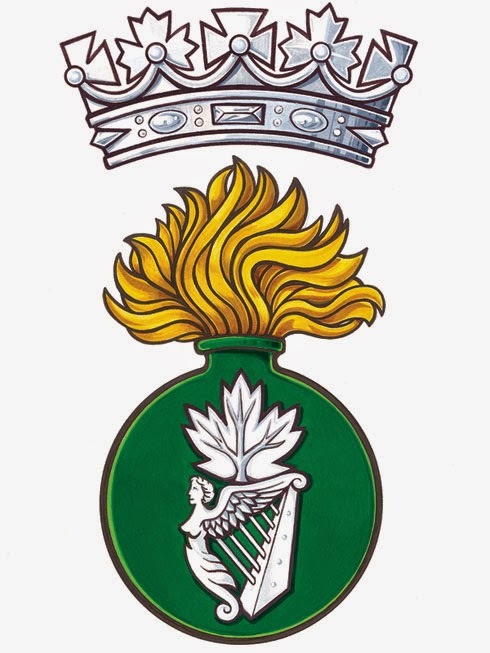 Many hundreds of men joined other Irish and cross channel units, particularly: The Connaught Rangers (two-thirds of the 6th. Bn. 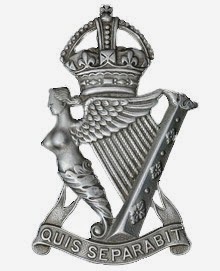 The Connaught Rangers was recruited in West Belfast), The Royal Irish Regiment (several hundreds were recruited in Derry & Tyrone) and several hundred Ulstermen were already serving with the 6th. Black Watch, T.A.). All this in addition to the several thousand men who were serving as Regulars and Special Reserve and the many Army Reservists who were called to the colours on mobilisation. During the Great War Ulstermen were awarded thousands of decorations of varying kinds for gallantry in action. Amongst these awards no fewer than 23 Victoria Crosses were won by Ulstermen, of these 9 were won in the Ulster Division - four of them on 1st July, 1916. This is indeed a splendid and imposing record for a small area the size of Ulster and one of which all Ulstermen may well be proud. The Allies had been at war with Germany and the Central Powers for just under two years, the opposing armies had "gone to ground" in the early winter of 1914. The old British Regular Army as we knew it had long since disappeared in a war of attrition in its most ghastly form. The French had been bleeding to death for months in the immortal defence of Verdun and the German Army sat tight in their formidable, self chosen, defensive positions of elaborate trench systems, fortified villages and woods. Something had to be done to relieve the pressure on our French Allies - to quote Winston Churchill - "All the spring of 1916 the French had been battling and dying at Verdun, immolating their manhood upon the anvil-altar; and every chivalrous instinct in the new British Armies called them to the succour of France, and inspired them with sacrifice and daring". This was the situation confronting the British Commander-in-Chief (General Sir Douglas Haig) when he decided in collaboration with the French Commander-in-Chief (Marshal Joffre) that we should take the offensive for the first time since the war began. The Allied Commanders selected as the point of their offensive what was undoubtedly the strongest and most perfectly defended position along the whole length of the Western Front. They were certain that if the enemy could be defeated here he would be more disheartened than being overcome on some easier battleground. The point to be assailed was the high ground astride the River Somme extending for some 45 Kilometres from a point near Sommecourt on the left, to Maricourt on the right, as the British Sector; thence further south to a point just south of Chaulnes as the French Sector. We are concerned here only with the destinies of the British Army but with special reference to the part played by the various Ulster Regiments throughout the long drawn out series of battles lasting some four-and-a-half months from 1st July to 18th November, 1916 and referred to as the Battle of The Somme. The British IV Army, commanded by General Sir Henry Rawlinson, comprised six Army Corps, the 7th. 8th. 10th. 3rd. 15th. and 13th. in line in that order from the left. Sir Douglas Haig decided that the 7th. Corps should carry out a subsidiary attack, only, in front of of Sommecourt on the left flank. The German intelligence, it is now known from records, were fully aware that a large scale offensive was pending, but they mistakenly misjudged the actual point of the attack as being between Vimy Ridge just north of Arras to the southern tip of the Thiepval Spur near La Boiselle, and it was along this sector that, we now know, that the enemy had laboured unceasingly for months to considerably strengthen the many Redoubts and Fortified Villages and no pains were spared to render these defences impregnable, it was along this sector that he had deployed his best and most thickly concentrated forces. The first and second defensive systems each consisted of several deep trenches, out into the chalky countryside and well provided with the most elaborate dug-outs as safe shelters against bombardment. The front of each system was well protected by elaborate wire entanglements, many of them in two belts, forty yards wide, built of iron stakes interlaced with vicious barbed-wire almost as thick as a man's finger. The labyrinths of deep bob-proof shelters surrounded each fortified position and were used to provide safe cover for the hundreds of heavy machine-guns and mortars and their crews during bombardment. Some of these dug-outs were in the stories and were of the most elaborate nature. Each strong-point was self contained and its heavy armament of heavy machine-guns cunningly concealed and sighted to bring mutual support by enfilade and flanking-fire to fire to their neighbouring garrisons. Supporting artillery and mortars were similarly arranged to produce the most effective cross-fire. This was the situation confronting the 8th. Corps facing the Serre-Beaumont Hamel Sector and the 10th. Corps Sector astride the Ancre Valley and facing the formidable Thiepval Ridge. South of La Boiselle in the sectors Fricourt, Mametz, Montabaun and a dozen more villages attacked by the British and French the enemy was taken at a disadvantage.